There's a new contest for Canadian residents only called Snag the Snare, where you can win one of three limited editing snare drums ore some other secondary prizes. 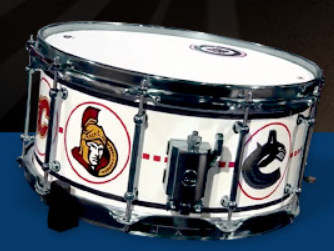 These snares are replicas of the drum Neil used to record his version of "The Hockey Theme." The contest ends on December 16. Contest starts on Monday, December, 5 2011 at 12:01 p.m. Eastern Time ("ET") and closes on Friday, December 16, 2011 at 11:59:59 p.m. ET (the "Contest Period"). There are (i) three (3) grand prizes (the "Grand Prizes"), one of which will be awarded in each of the following three provinces from among all the eligible entries received in each of these respective provinces during the Contest Period: Ontario, Manitoba and Quebec; and (ii) thirty (30) secondary prizes (the "Secondary Prizes"), each consisting of a CD, DVD or Blu Ray copy of "Rush -- Time Machine, Live in Cleveland" of which four (4) CDs, four (4) DVDs and two (2) Blu Ray copies will be awarded in each of the following three provinces from among all the eligible entries received in each of these respective provinces during the Contest Period: Ontario, Manitoba and Quebec, (the Grand Prizes and Secondary Prizes are collectively the "Prizes" and each a "Prize"). Limit of one Prize per household. No purchase necessary. The contest is sponsored by TSN, Rush, and Drum Workshop. 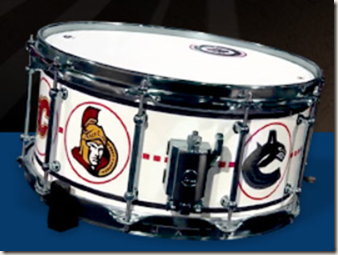 Read more about Neil's "Hockey Theme" drum kit.